This is the most frustrating AMV I've made yet, as far as beating my head against a wall, trying to make something work that just would not work. I was *this* close to throwing it in the recycling bin dozens of times, but I'm trying EXTREMELY hard to break my habit of not finishing AMVs so I decided to keep plowing ahead. This decision was influenced greatly by the five people I went to saying (after about 50 hours of work): "So what do you think, should I just chuck it?" 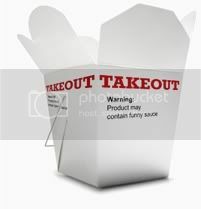 As it turned out, each of them encouraged me to finish Takeout while also confirming everything (and more) I feared about it. They have my thanks on both accounts, as their input did change this AMV, hopefully for the better: Amo-Chan, Copycat_Revolver, godix, JaddziaDax and meleechampion. Premiere Pro, After Effects, Photoshop and Illustrator. As a side note, all the masking in this AMV was done entirely with Photoshop, so the next time someone tries to sell you on AE for masking, just remember that even people who do use AE sometimes choose not to. In my case, it was because most of the scenes I had to mask needed other work done to them via Photoshop, and hopping back and forth between PP, AE and PS to evaluate the results every other minute was not the most efficient way to handle things. Time spent: Approximately 100 hours. Half of that time, however, was entirely devoted to masking, compositing, graphic creation, lip flap removal, scene alterations, plastic surgery and wardrobe changes. There was a good amount of work that went on behind the scenes to make this AMV come together. It’s not “Whisper of the Beast” level by any means, but if you find yourself wondering where a certain scene in the series occurs because you can’t quite put your finger on it, I can pretty much guarantee it’s because that scene doesn’t exist anywhere but in Takeout. The “Beef. It’s What’s For Dinner” campaign of the National Cattleman's Association premiered in the early 1990's, promoting red meat as a healthy part of one's diet. * Prominently featured in both television and radio advertisements was music from the ballet "Rodeo" by composer Aaron Copland. The campaign's tagline is now considered one of the most famous in advertising history, as it is instantly recognizable by 88% of Americans. *For those who may remember, this was also around the time margarine was heralded as our savoir from butter and eggs were considered a terrible sin. The dietary status of margarine and eggs has since been revised, and – unsurprisingly - so too the benefits of beef. I personally still love a good steak, but I am guilty of making meatballs out of ground turkey.